As an incentive to tickle your generous souls into supporting our project, we have gathered this juicy bunch of rewards you have the option of requesting with your pledge! New and Exciting rewards will be posted up throughout the campaign so keep an eye on their page and on our social media! YOUR NAME IN THE HALL OF FAB! Pledge just £10 and go up on the walls of our next event! Everyone will know who to thank for the good times as we cover the walls in the names of our generous pledgers, and dedicate a whole page to the Hall of Fab on our website! Get your own personalised BIG UPS at Bubble Club! For just £20 become one of the amazing donors who gets mad love and respect on stage at our next event in November. Be the first to donate £50 and receive one of the custom designed T-shirts straight from Bubble Club HQ, so you can support us loud and proud! VIP DELUXE EXPERIENCE @ BUBBLE CLUB! Table service, grand entrance and special surprises! 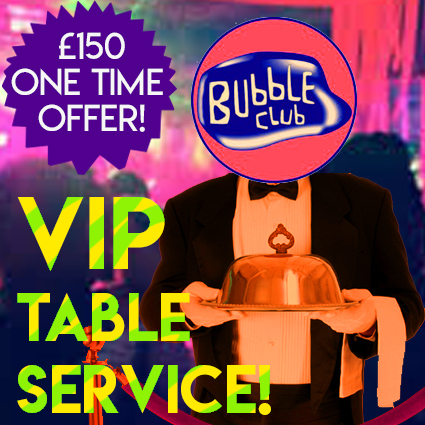 At your Bubble Club, we will party in your honour where you can enjoy VIP table with a complimentary drink, snacks, and plenty of super surprise perks! Sparkle 'n' Swagger with these laser cut Bubble Club logo medallions! The next 50 donations of £100 will receive their own, handmade and totally bespoke medallion, to show the world what a total and utter legend you are. Donate now before they all run out! ONE TIME GIFT OFFER! -- A DJ lesson from Bubble Club's very own DJ T-WAY!!! DONATE just £150 to join the Bubble Club team to learn to beat match, mix and select your way through the day, with your very own dance troupe, the Bubble Club management team! With a donation of £200, you could have your very own personalised RAP VIDEO, created and produced by the Bubble Club Gang! Dig deep for this once in a lifetime chance! Bubble Club will CURATE your party! Using all the act booking, decor making, night enhancing tricks they have, Bubble club will provide music decor and unadulterated VIBES to your event! watch out for these limited offers With a £150 Donation!